Mysterium is a purely co-operative game for 2-7 players. One player takes the role of a helpful ghost who lives in a mysterious ancient manor. Other players are a group of psychics invited by the manor owner to solve the mystery of the place and bring peace to its residents, as any person who stays in the castle sees strange dreams. The ancient legend says the ghost is the soul of the manor's previous resident, who was unjustly executed for a crime he didn't commit, more than 100 years ago. Now he tries to use the mysterious signs to tell people the truth about what really happened, so that justice would be established and he might rest in peace for ever. The specialists in the supernatural were invited to try to understand what the ghost wants to tell and in case of success be honoured by one more victory and receive a generous reward. They have 7 days and 7 nights to reach their goal. If they succeed in time, everyone wins the game (including the ghost). *A wonderfully different take on a murder mystery. A fantastic variant on Dixit and a vibrant, artistic version of Codenames. *Enables players to utilse logic, yet no answer is ever 100% certain. *time restrictions and player voting mechanics do not feel like they work well, but can easily be swept aside if players don’t get along with them. A wordy opinion: Mysterium is one of the strangest experiences I’ve had the privilege to soak up. Based on the original Polish title Tajemnicze Domostwo, Mysterium is a game I absolutely adore. However, this English edition manages to leave my opinions flying around in Limbo. Which, considering the subject matter, is actually quite fitting. In 1894, a murder took place in the Count of Warick’s manor that was simply put down to accidental death. With supernatural activity on the rise, it’s clear that the blameless victim is not resting in peace. You and up to five other mediums will attempt to make contact with the ghost now haunting the halls of the house in a bid to find the culprit and lay the spectre to rest. I ain’t afraid of no ghost…because it’s my friend. When I say ghost, I don’t mean the spooky kind, but a friendly, cooperative sort played by a member of your own party. As the police made an absolute shambles of the investigation several years ago, the ghost is the only one who really has a good idea of what happened on that fateful night, and will be attempting to convey facts about the murder to the mediums over the course of 7 hours. Problem is, years of death have made their memory quite hazy, and it’s pretty hard to communicate when you’re on a completely different plane of existence. Each psychic has a set of leads to go on, consisting of standard Cluedo fodder of suspects, locations and potential murder weapons. As a ghoul though, you can’t simply point at the guilt ridden and say ‘Oh, it was them. Case solved.’ The ghost must send out a series of visions to the mediums by picking out a set of wonderfully illustrated cards that look like the result of what would happen if Tim Burton tried to do a reimagining of Dixit. At the start of the game, the mediums are trying to track down suspects, and as the ghost draws up to 7 Vision cards, they AGONISE over what to do next. I can’t really blame them. They’ve just been given a set of potentially the oddest images they’ve seen in quite some time, and have to link those acid trip fuelled visions to the suspects in question without uttering a word. Is it a bird? Is it a plane? W…what is it? The visions are filled with peculiar oddities, sights that resemble the oddest of dreams. Linking these to reality is quite the task. The clues you wish to give should be as specific as possible in relation to what each medium is trying to find…but everything in Mysterium is left very open to interpretation. When you’ve found a number of Vision card you feel fits, you hand them off to the relevant psychic, draw back up to 7 cards and repeat the process for everyone. All the while, the mediums are left to ponder just where you’re trying to guide them. The cards representing the leads the mediums are following are just as well illustrated as the Vision cards, with all clues contained in them grounded firmly in reality. If the psychics guess the suspect correctly, they move onto locales. Complete those and they finally move onto murder weapons. Throughout the investigation, the mediums can also judge one another by voting on which guesses they think are correct and which are wrong. As players take their pick on where they think the ghost is leading them, others can place ‘clairvoyancy markers’ indicating. For each correct answer, you move up the clairvoyancy track, a makeshift scoreboard for the players. If the mediums manage to guess all of their leads correctly before seven rounds are up, a group séance is initiated to find the culprit. All psychics lay their groups of card on the table, the ghost picks one group as guilty, and puts out three Vision cards linked to that set face down. What cards the mediums get to look at depends on how high they are on the clairvoyancy track. If they’re low down, they are only allowed to look at the first card before voting on who they think is guilty. Those in the middle of the track can see two visions before voting and high scorers see all three cards before handing over votes. If a majority of psychics vote correctly, everybody wins. It’s a wonderful take on the traditional murder mystery, one in which you have to use your heart as much as your head. It’s just that there are a couple of things that don’t really sit well with me. A Ghoul That’s Trying Too Hard to scare. The issues I have with Mysterium come from its additions, the first being a sand timer. You’re meant to make your guesses within two minutes, flipping over a sand timer when the final Vision card is handed out. I can see why people would think this would make the game harder, but it’s actually counter-intuitive. With this timer, you’re not given the time to dwell. The time to doubt. The time to listen to everyone elses opinions and make your brain a psychological minefield. If you ditch the timer, the game becomes a more streamlined and yet more terrifying experience. The clairvoyany tokens also don’t exist. They’re not necessarily bad, but in a purely cooperative game they don’t feel like an easy fit. Maybe if you play with more competitive pals it’ll work a bit better, but it just feels somewhat unnecessary for us. In this case, the end-game also alters. As players can no longer vote, all psychics get to look at all the cards the ghost puts out, and are freely allowed to discuss theories with one another in a bid to solve this grand logic puzzle put before them. It’s simpler yet a whole lot more satisfying. None of these are in the original 2013 title, and I personally think the game is better for it. As these additions are all modular though, it’s easy to simply sweep them off the table. If you want to give the old rules a whirl, I will post a link to the old rulebook at the end of this review. Far be it for me to tell you how you should be playing your games though. Whatever way you play it, Mysterium is a fantastic little title that you should definitely get if you’re looking for a reimagining of Dixit, a more artistic take on Codenames or are simply looking to make Cluedo a bit jealous. Mysterium, described as the thematic Dixit. In Mysterium one player takes on the role as the ghost who was unrightfully accused of a murder years ago and the rest of the players takes on the roles of mediums trying to solve and find the correct murderer of this crime by interpretation of their respective visions. As this happened a long time ago each medium will have a different view of the what really happened and after each medium has concluded with a weapon, place and culprit it’s time to put your minds together to determine what really happened those days of yorn. The player portraying the ghost randomly chooses a weapon, place and person combination for each player taking on the role as mediums and adds some more depending on what difficulty level you want to play. These are placed on the table in that order while the ghost will keep a copy of the correct combinations behind the screen hidden from everyone else. When everyone has taken a guess on weapon the ghost reveals which player(s) came up with the correct answer. Those who found it will get a new clue to where the crime took place while those who missed will get a new clue which combined with the previous one will hopefully guide them to the correct target. Hopefully by the end of the 6th night everyone will have found what they have interpreted as the correct combination and now everyone must combine their visions in one final round to try and conclude how it really happened from one final set of clues. Mysterium is a family friendly party game that is fun those time you want a lighter game. For the first game I’ll recommend someone with previous experience taking on the role as the ghost but after a playthrough it should be of no problem for anyone to do this part. As the ghost it is also important to listen to what the players are talking about because that may just be of help to what clues you want to hand out. In fact, the worst ghost I’ve experienced is probably the player who has played it the most. Simply because he gets to set in his own mind and won’t defer from that thought. This review is based off the Polish version of the game, there are significant art and some minor rule differences from the Asmodee version. But essentially it is the same game. If a board game can be defined as such a thing as a sleeper hit then I think Mysterium is one, originally published by Portal Games back in 2013 this has long flown under the gamer radar. I personally didn’t know of its existence until rumblings started to emanate from Essen 2014, people had played a game that nobody could pronounce Tajemnicze Domostwo and had come away wowed and excited. Upon digging further all I could discern was it took the art led play style of Dixit and meshed it with the murder mystery of Clue, with players taking the roles of psychics trying to discern meanings from gothically beautiful cards played by the ghost. Attempting to find out just what this was all about almost turned into a game itself. Mysterium is a mash-up of Dixit and Clue (Cluedo for us brits) by way of a David Lynch fever dream. One player is the ghost who is trying to nudge the psychics to establish who committed his murder and with what weapon and where, this is accomplished by playing dream cards which are beautifully rendered surreal pieces of art, the sort of thing Dali would have come up with after consuming a couple of cheese boards. The investigators have seven days in which to narrow down the field of suspects and eventually to all agree on who the culprit was with only the dreams to help. The game hinges on whether the ghost can tune into the minds of the players and lead them to success or sit silently wanting to punch them as they fixate completely on the wrong part of each new clue. It really is very simple, and its a hoot. There exists at present two rule sets for the game that differ in various ways the Polish version and the Ukrainian, they mix about the order of play and differ significantly on how the final round is played. Already homebrew equivalents have materialized on BGG either through happy accidents or misunderstanding the translated rules and I’m sure as time goes on more will emerge. The thing is I’d suggest going with whatever feels the best for you and your group, either variation works fine and I’ve combined bits of both to make for the most satisfying game for me. This game has hit at the perfect time riding a wave of renewed interest in lighter fare whilst simultaneously offering a satisfying meal that is both nutritious for those new to the hobby and chewy enough for us old stodgy gamer types to sink our teeth into. So is it any good? Yes is the short answer, its possible with the storm of hype that this has acquired that some will be left scratching their heads when finally getting a chance to sit down and play it. This is a slight game with a party feel that I think has gained the sudden and instant following by managing to capture a neat mix of theme with an easily explainable hook that means virtually anybody can play it. And the confusion over the rules (normally a major issue) has actually helped to further the mystery rather than hinder, everybody likes to tinker and have an opinion and this has certainly helped foster that mindset. The games lightness and adaptability has allowed for these variants to start to pop up. Lets be clear Gamer’s looking for something deep or intense will find this wanting, despite the theme and Gothic art style this is at heart family friendly fare and may disappoint those seeking something that’s not here to find. I was never a huge Dixit fan, I liked the idea of what it was doing but it never hooked me. Now along comes Mysterium which has just enough of a theme and story that Its really caught my interest. I love the art choices here, the fact that we get these stunning Tim Burtonesque, Addam’s Family style locations mixed with the otherworldly feel of the dream cards. And that theme although sleight works so well with those cards that it delivers a complete package that Dixit with its big stack of crazy never quite did, I think that’s just me and my love of story and theme rather than an issue with either game but I’m putting you in my head space. So to sum up, the hype is well earned, this is just something different and in these days of regurgitated themes and mechanisms hits quite a refreshing and macabre note, the fact that it plays effortlessly to gamer’s and non is a huge bonus and I can see this arriving on quite a few tables during the festive season and beyond. Clue is a great concept, but what if you could work together to solve the mystery? In Mysterium one player is a ghost who has to provide clues to the other players through strange dreams (weird drawings on cards) alone. The players (minus the ghost) then work together to figure out what their dreams meant and solve the crime. Mysterium is the most replayable game I have ever played in this genre. Because any part of the dream pictures could be the clue, be it one tiny doll on a shelf, or the general color scheme of the dream. The game totally relies on the players to keep it interesting, to find cool things in the pictures to use as clues, which makes it infinitely replayable. I have the original ukranian version of the game which has (in my opinion) better art work on the cards. It also has few extraneous game pieces and is completely cooperative (I believe the newer version of the game has some competitive aspect). This is my favorite whole family game of all time, it gets my gramma and younger cousins arguing about what I intended the dreams to mean and who did the murder, in what room, with what weapon. If you like Clue and/or Dixit you’ll like this game. It has the elements Clue does with trying to discover the actual person, place, and weapon with more replay value (I feel). You work together as a team racing against time to solve the murder instead of racing against each other to compile the clues. It also throws in the likes of Dixit where you have to try and guess what the person is getting at with the clue’s given. In Mysterium though the clue-giver, a.k.a ghost, can’t talk and everyone else is left to debate the meaning of each clue given. Replay value is high with the expansion for the game, the variety of the cards already included, and the fact that you can use cards from Dixit as clues. It’s not hard to pick up so can be played with just about any age group. Playing as the ghost takes a little bit of experience so isn’t recommended for first-time players. 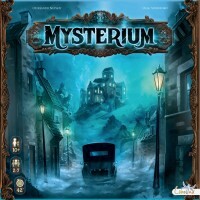 Add a Review for "Mysterium"